Here is a gift I have just finished for my sister-in law's birthday. 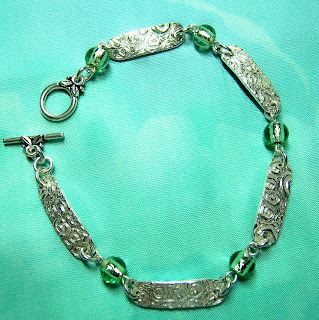 It is a bracelet with links fashioned from silver clay, separated by green glass beads lined with silver. I am not an expert at making jewelery, but I do enjoy working with the silver clay and creating a one-of-a-kind gift! I found the toggle at our local bead store and thought it made a pretty addition. This is not the best photograph, taken under artificial light, but I had to get the bracelet packed up tonight so that I can get it in the mail first thing in the morning! My Needlearts Guild has a challenge for our upcoming show. Those of us who are interested in participating bought a yard of the same red flowered fabric which we were to use to create an original project for the exhibit. Here's my result! 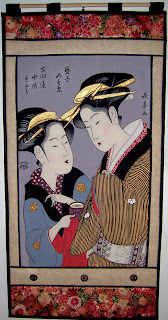 The fabric had an Asian feel and when I saw some "Geisha" panels for sale at a recent quilt show, I knew that I had found my project. The ladies originally had very white faces, but I decided to shade their skin very lightly with peach Prismacolor pencil. I also used gold fabric paint on their hair ornaments to add a shimmer to go with the gold in the challenge fabric. A friend sent me a paper quilt challenge which I decided to try. I missed the deadline, but decided to finish it anyway, since I have enough UFO's lying around as it is! 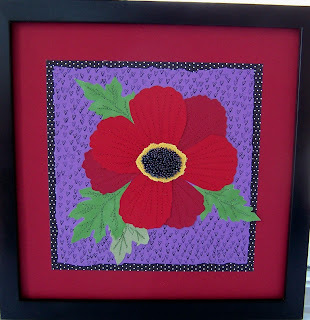 I used scrapbook paper, machine stitching, stamping and beading. I'm hoping to make two more flowers and call it a series. Also, I was happy to find a perfect 12"x12" frame at a craft store, which makes framing easier. I took the photograph without glass on the picture, but will add glass and separate it from the artwork with narrow strips of matboard to avoid crushing it. 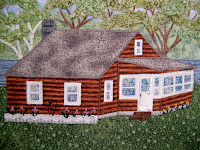 I recently finished a house portrait for a client. The project had taken me much longer to finish than expected, but my client was wonderfully patient and pleased with the final resu lt! 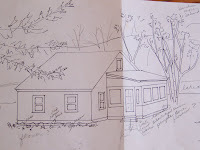 I began with a drawing based on photos of a vacation home on a lake in Maine. 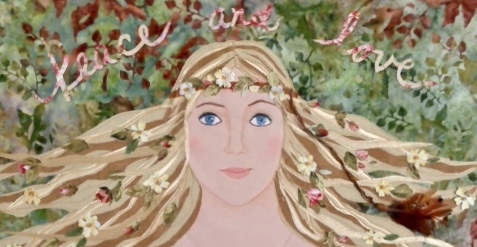 I had the original drawing enlarged, then put the enlargement on a light table and traced the different components on Wonder Under on the reverse side of the drawing. I then chose fabrics for the house, trees, etc., and ironed the Wonder Under-ed components on to the backs of these fabrics. After cutting out these components, I reassembled the "puzzle pieces" and ironed them down to create the picture. 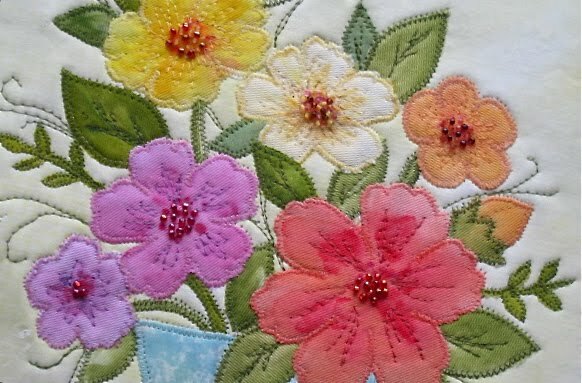 All pieces were stitched down with a zig-zag stitch, some textile paints were used for shading, flowers were hand embroidered, and a linen border was added. It felt so good to finish this project and to know that my client was pleased!!! 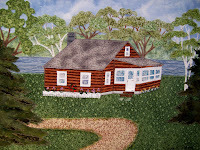 I've done many house portraits over the years, and doing this one reminded me of how much I enjoy the process. The main drawback, as with any handwork, is that it is nearly impossible to charge for the many hours that go into such a piece of work! It's an artisan's dilemma! 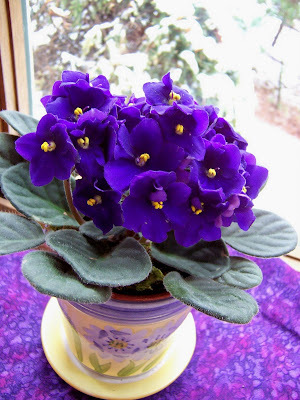 Yesterday, my good friend Debbie came to my door with this Easter gift - a gorgeous African violet! Then, last night, we had a snowfall and I thought it looked lovely on the windowsill with a snowy bush right outside the window. 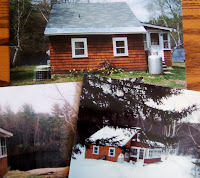 Ah, New England - snow in April!! Lately, my mind has been darting around, reluctant to focus on any one project. I have a commissioned house portrait to finish this week, a quilted paper flower in process, a new package of silver art clay just begging to be shaped into a pendant or earrings..... It's a rainy week and I have the blahs! Must get going tomorrow and jump back in!